Sometime in February, in a fit of online shopping enthusiasm, I found myself at Hulu purchasing some Knit Pro (aka Knitpicks) interchangeable needles. Now, to be fair, I have quite the supply of needles already, and I'm not at all sure why I thought I needed some interchangeables, but there I was. I was in enough control of myself not to blow a ludicrous amount of poundage on the full set - I tend to use the smaller needle sizes (less then a US6 for the most part), so the full set would have included a bunch of needles I wouldn't have used very often. So I got the starter pack. And some smaller tips (US 3, 4 and 5s). And three extra cables. Etc, etc, etc. I've now used them in 1.25 projects, and I really like them. The wood feels nice, they stay screwed in as long as I make sure to tighten them with the provided cute little wire thingy, and the tips are nice and pointy. 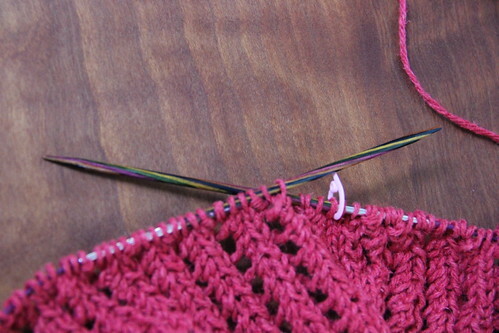 So pointy in fact that I now have a small hole in my left index finger that makes knitting a bit/a lot (!) painful, depending on how much attention I'm paying to my finger/needle tip contact point. I'm pleased with them. And the 0.25 of a project that I've done on them that you can see there is the first 20-something rows of the Gemini pullover from the Spring/Summer 2012 Knitty. 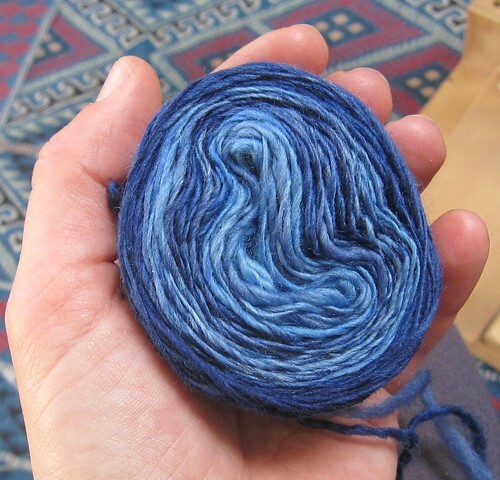 The yarn is some Hemp for Knitting Hempwol in "Ruby". It's mostly red, but in some lights it looks pretty orange. A bit stiff to work with, but I think it will be a good fiber for my current climate. Now for the stash enhancement: last Friday I had a real treat - I got to go yarn shopping with a good knitting friend formerly from Houston, who now resides in the Land of good chocolate Switzerland. We went to Loop, which continues to be a trial to my bank account. But I was really good - I came away with only two skeins, neither of which was the £40 lump of Wollmeise lace (orange, of course) that was serenading me. She was equally restrained, and we retired to the local pub to drown our regrets in beer. 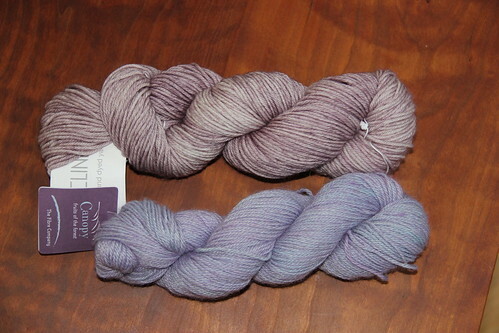 These are the babies that came home with me: two skeins of purpley DK/sport weight for mitts. I think the Madtosh will become some Fallberry Mitts, but the Canopy is for another (yet another!) design project, also mitts. and yesterday it got thrown on the loom as warp - C, I'm going to need your snail mail address in Switaly, OK? 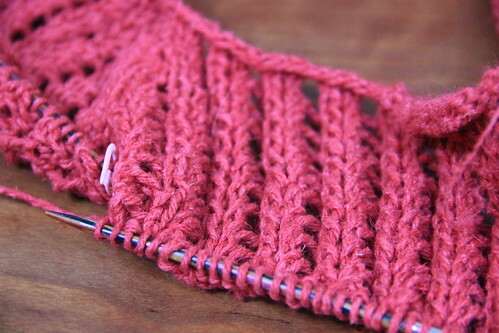 Written by porpoise On March 30, 2012 In "designs", "handspun", "stash", "sweaters"